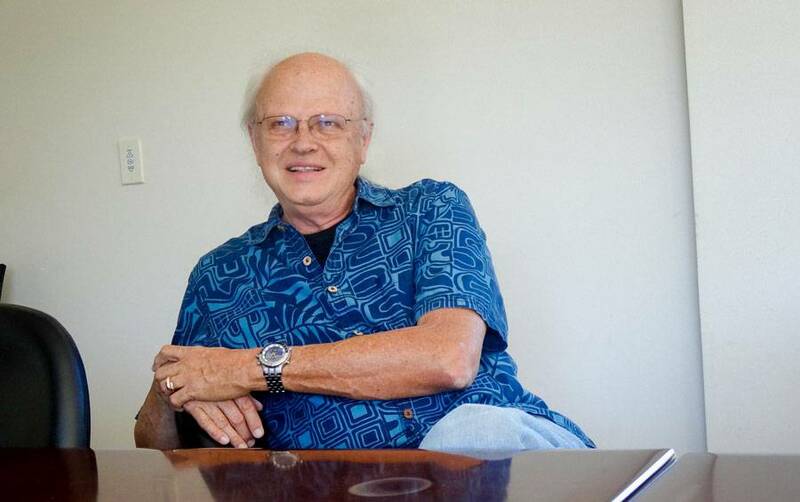 If you’re a Star Wars fan, you know Dennis Muren. 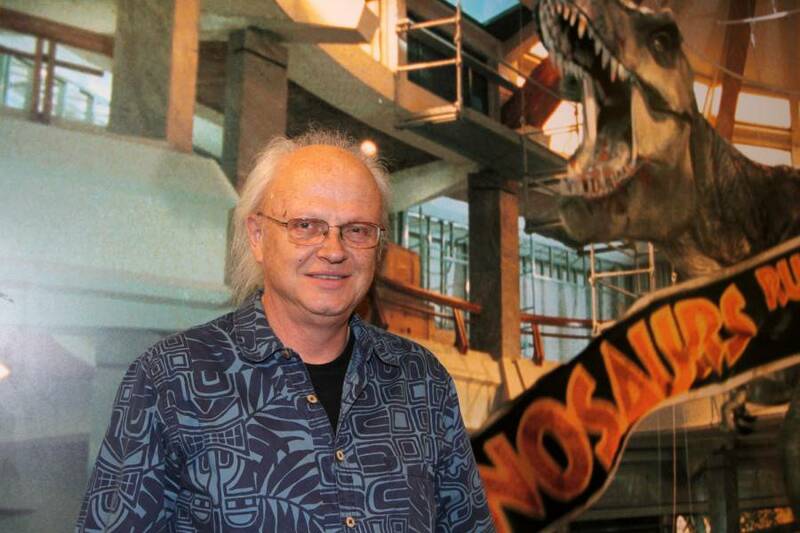 If you’re a visual effects fan, you know Dennis Muren. I’m actually more surprised when I meet people who don’t know one of the most prolific artists working in the industry today. 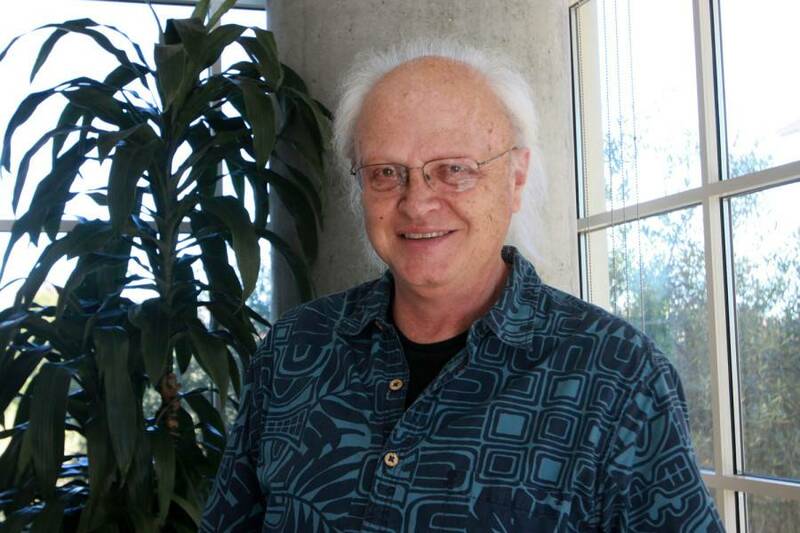 Dennis Muren, a southern California native (Glendale/Pasadena area), is the first visual effects artist to receive a star on the Hollywood Walk of Fame. He’s been nominated for fifteen Academy Awards and took home the gold eight times, including films such as Jurassic Park, Indiana Jones and the Temple of Doom, and Star Wars Episode V The Empire Strikes Back. 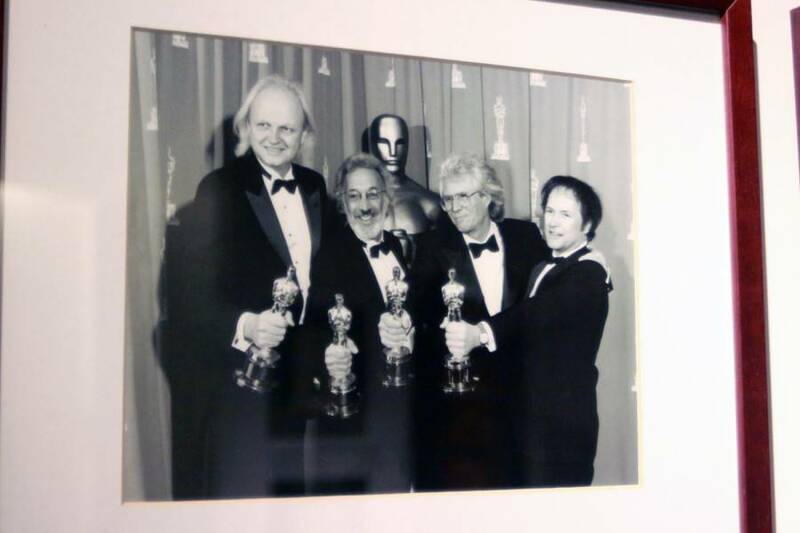 Dennis is still working at Industrial Light & Magic in San Francisco while also working on a new book on visual effects. He took some time out for us to talk about an old favorite: Star Tours. EE: Dennis, great to see you and thanks for your time! EE: For me, growing up in Southern California, the Star Wars movies on VHS and Disneyland were my biggest inspirations. What were your biggest inspirations? Dennis: You know, that’s a good question. Field-wise, I guess it’s something always to do with visual effects in movies. When I was about five or six years old, my folks would go to the movies and I’d go with them sometimes and see like War of the Worlds or something like that. I just loved the spectacle of it. I would always want to see that kind of stuff when I walked out of the theater but it was never there! I remember going to New York City when I was a ‘single-digit’ aged kid and the spectacles of the buildings and the canyons of the concrete was just amazing. So between that and maybe the boredom for the real world, I don’t know, I was just really into that sort of fantasy. But I couldn’t draw and I couldn’t paint so I got into photography as a way to do it. EE: And you started doing photography when you were about ten years old? Dennis: When I had a still-camera I was much younger than that but when I was about ten I got an 8mm camera and made little movies with plastic dinosaurs you can buy at toy shops, maybe some space ships too. I’d make my own version of Destination Moon or something like that [laughs]. EE: Was animation something you were into as well? Dennis: Yeah, I did some claymation and later on got foam rubber, wire and latex. Those were like imitations of Ray Harryhausen films. Ray’s work was consistent. Meaning every year there would be a new Ray Harryhausen movie out even though I didn’t know who he was or that it was the same guy. But every year there was one of these movies. I wouldn’t say that they were real, but the ideas were so incredibly strong and bold. EE: Yeah, the quality of the ideas were good. It trumped the feeling of not being real, I didn’t care about that. I liked the intent of it and it was way beyond what most Hollywood films were doing. He was really out there with the intent of doing something. EE: You were about nine years old when Disneyland opened. Do you have any memories or recollections about that? Dennis: I remember driving by Disneyland the day it was open. I was pretty young, sitting in the backseat on the way to San Diego to see some relatives and it was opening day and I just wanted to stop. I asked “Can we stop, Dad?” We didn’t stop but I went a lot. A lot meaning probably 5-10 times or so in the first ten years it was open. EE: For back then that is a lot! Did you ever see Walt Disney or meet him? Dennis: No, I never did but a friend of mine did. He was working there a while and Walt came through once. EE: The Disneyland television program must have been a real inspiration for you as well at the time was it not? Dennis: Oh yeah… I think it was Disneyland first and then World of Color and Wonderful World of Disney… yeah there were always insights. I mean I still remember the Darby O’Gill episode, you know, where they showed Walt behind the scenes but in the same settings with the little people… it was amazing. EE: Those shows were probably audience’s first exposure to behind the scenes and bonus features that you get now on DVD. Dennis: You know, I never thought of that but that’s exactly right. That whole show was, whether it was for animation or even merchandise, talking about the Davy Crocket cap, you were really aware of the whole business side and how it all came together. EE: Right, and even if it was something you weren’t normally interested in, there was something about it that was still fascinating to watch because you’ve never seen anything like it before. Dennis: Have you been to the Walt Disney Family Museum here? EE: Oh yes, I absolutely love it. Dennis: Yeah, it’s great. There’s so much in there. EE: Fast forward now to working on Star Tours. How did that all happen? Dennis: I really tried to spend a lot of time with my family and I didn’t want to do a show that was going to pull me away from here. 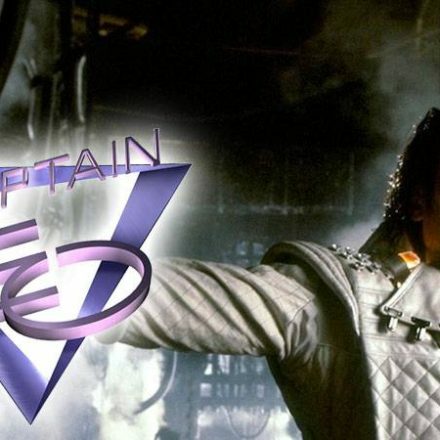 So I got involved with Captain EO. We redid like 17 shots on that show. It was being done at Disney and they weren’t working out for whatever reason so we got pulled into it. And that was neat having to go down and watch the dailies with Michael [Jackson] and all the other people involved. It was probably after that where Star Tours came in and it wasn’t a big show so I could do without having to travel. Also the idea was a single point of view on a film was something I really liked seeing. Having long takes, it seemed like a neat idea. It was a chance to try some computer stuff that we had experimented with on the previous five or eight years or so at ILM. One of the thoughts I had after doing the Star Wars films was to make each shot designed on its own and you set up the ships to make the most dramatic view. But what if you set up the ships like they are in the real world spatially and you put the camera wherever you want to see what it looks like. I thought that it would have an amazing sense of reality to it. In fact, it didn’t work it at all because it’s not nearly interesting enough to look at. You get shots but they were boring so that wasn’t really the way to do it. But that was a great experiment because we learned a lot doing it. Then we went back and said let’s just make this visually neat, and we used that as a base. All the scenes had to cut together as one continuous flow. Dennis: Yeah, I was not a fan of that. I think it was Tony Baxter and Tom Fitzgerald who were saying that it’s very iconic. It wasn’t to me because I see everything as kind of the same. But then we did work that into it though and I guess everyone loved it. I’m not the one to say what the public wants because I know it too well. EE: What would you have done? Dennis: The thing I wanted to do different, if I’m remembering this right, I wanted the audience to be Luke. And I wanted them to be talking to you as Luke and I wanted the audience to talk back. I thought that first person thing would be really kind of neat and fudge it here and there but it would get each individual or everyone in the same mindset. Maybe you could do the entrance to the trench run or maybe you didn’t. The entrance into the trench run was probably one of the reasons I was hesitant on that because I didn’t quite know how to do it with the technology at the time. And eventually we had two layers of depth instead of just one or something like where it was hard to make the blend but we finally got it to work. And I think it was Tom Fitzgerald who really didn’t like that and wanted it to be more like a tour. We’re all travelers. So eventually George put it together and that’s the way it came out. And I was probably wrong about that because what do I know about Disneyland rides, but as an audience member I would have liked to have been Luke. But it all worked out and whatever it is, it is. EE: Were all the miniatures for the attraction built from scratch or were they pulled out of the archives? Dennis: I think they were rebuilt and we built smaller ones also. The shots lasted longer and our camera track was maybe forty feet or eighty feet at the time. We were limited to our shot lengths and we were limited to how far away you could get to have something in the distance. Everything had to be pushed down so the models were half-size, and maybe we extended the track another forty feet to be able to do that, I don’t remember. EE: What did you think of the experience when you first saw it? Is there anything you would want to fix? Dennis: You know, I’m really happy with the visual on the ride for what we had to deal with. I know all the technical tricks that we were doing like holding as long as we could and then panning over which was a transition to a whole other set, I like all that. I was surprised at the platform though, the simulator. We found a lot of interesting things because it doesn’t just do what the visual says it should do. You have to cheat it. And the guys programming it had to inform me of that so it was really interesting. To go fast, they tip the seat all the way back so you feel like you’re sinking into your chair, so I thought that was really interesting. It wasn’t as strong as I wish it had been though. I felt that way with all the simulator rides. The visuals usually look pretty good but I wish there was more of a way to get the real thrill of your body being pushed back. EE: There’s a ride at EPCOT, Mission:Space, where you watch a video of you launching you into space but you’re really just spinning at a high rate of speed and gives you that sensation of shooting into space. Dennis: Oh really? See, that’s great! So people have been thinking about that. I would like to see that. That’s great. EE: How was it that we visit Endor in the original ride? Dennis: In the beginning, I don’t remember who came up with this but the idea for the first Star Tours being these four choices. And of course we go on the dullest one. I remember we set it up that way where you have the Hoth Battle and then you have the Space Battle and then you have Endor. You’re sitting there going “Boy, I hope I get the good one” but when you sit down you go to Endor and it’s one of those false… tricks that you have to mislead the audience, and I think this is how we ended up doing it. So something happens and you end up in a battle and it’s the most fun of all. EE: See growing up with Return of the Jedi, I WANTED to go to Endor! Dennis: [laughs] Well we always looked at Endor being Ewok Land and as adults we don’t want to go back so much to Ewok Land. Maybe for kids, you guys were fine with it. That’s funny. 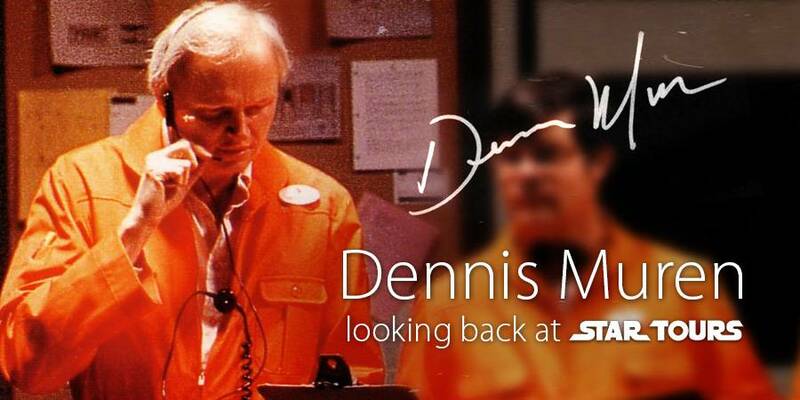 Dennis’ Muren Cameo in Star Tours. Pay attention to the window on the right. EE: Tell us about your cameo in the ride video? Dennis: I sort of directed the show. Me and a couple of the model makers, Steve Gawley, Ira Keeler, so it was really whoever wanted to do it. I don’t think I said that I was going to be in it but whoever was producing probably said that I should go in and do it. And we put those in there for scale. Because as you’re going through this thing you need to know how big the space is for reference. And the funny thing about Ira is that we didn’t know until the end that you were not allowed to work at Disneyland if you had a mustache. But we figured it was behind the scenes, and I think since it was a George Lucas project, they never asked to redo it. I didn’t know you couldn’t have beards and mustaches at Disneyland. EE: Have you experienced the new Star Tours? Dennis: I haven’t seen it but I’ve seen it while we were doing it. I wasn’t involved but I commented a little bit here and there about it. EE: Did you have any input? Dennis: You know, years before, we did a test with our games group of a Hoth game to see if we could even do a simulator ride. If it was up to the level, a game engine of flying toward a Walker, I mean, it looked really super good. Maybe we could actually make this work. EE: You’ve been working in visual effects practically and now mostly in digital. How do you feel about practical effects versus digital? Dennis: I like the feel and the touch of the models and all that stuff. But something like Star Tours is perfect for computers and not for models. I don’t know if you’ve seen the Back to the Future Ride, you always have to pan off something and you design it into the ride. You could hide it with the right story but it’s best to just let it go where your mind wants it to go. EE: Star Tours definitely did it better than most of them out there. Dennis: Yeah, working on Star Wars I was aware of all the tricks. There’s laser blasts you could do, there’s flash frames or transitions, quick pans, jump cuts… I probably had a backlog of those tricks that we could use. And because I was designing it I kind of knew where we put in a TIE Fighter shooting so we could fly up quickly. The idea was to get this blur when you transition and then you can change the scene. EE: You didn’t work on Star Wars Episode III. Why was that? Dennis: Right. I actually didn’t want to work on Episode I. It wasn’t as much Star Wars as the original ones. If it doesn’t have Mark, Carrie, and Harrison, it’s something else. But that’s just me. And I’ve done so much space stuff that the things I gravitated to were the non-space stuff. So I did the underwater scenes on Episode I.
EE: Would you say yes to Episode VII? Dennis: Oh I don’t know. Maybe! I don’t know how it’s going to be yet so maybe parts of it. But I don’t want to be a big uber person on it because it’s probably a lot of space stuff, which I don’t want to do so much of. For Phantom Menace it was the landscapes. EE: Can you tell us what you’re working on now? Dennis: I’ve been working on this book! It will be here with the next ice age. [laughs] It’s about observation and inspiration and how to get ideas in the real world to put into effects. And there’s a science aspect to it too and making painting, models, and CG more realistic. It’s a way to see deeper. Like taking a bottle of water for example, and seeing what makes it look plastic or how the reflections look the way it does. And if you don’t get those things right, it looks CG or a matte painting. EE: We look forward to seeing the completed book. Thank you Dennis! 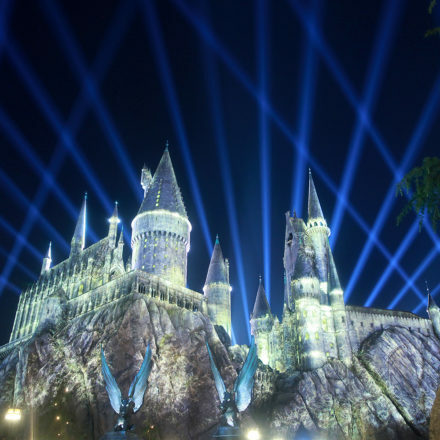 Star Wars Weekends Return to Orlando in 2014!